breadcrumb trail > Tailored Suits by Jasper Littman > Blog > Bespoke Tailoring > How do I assess the quality of a tailored suit? How do I assess the quality of a tailored suit? When purchasing other products we can be assured of the quality by certain benchmarks, measurements or grading systems. For example when booking a hotel we know that the highest quality hotel we can choose from will usually be the five star option. Similarly when booking an airline ticket we know that if we fly first class the quality of service cannot get any higher than that. However there is no similar grading system for the quality of tailored suits. Buying a tailored suit is difficult enough already due to the lack of regulations on how they must be labelled, and it’s only made more confusing by the fact there are no yardsticks for comparison, no Michelin guide, no star rating and no bronze, silver or gold label. This may be because tailoring is an art form using many different components and craftsmen that cannot be easily measured. Clients occasionally ask me questions like “Are your suits fully canvassed?” or “Do you use horn buttons?” because they’re looking for some sort of yardstick that gives them an idea of the construction quality of our suits. The truth is that horn buttons and full canvassing are all very well but they give you no indication as to whether or not a suit will fit you, or more importantly flatter you. If you will sleep better at night knowing that your suit has real horn buttons then that’s great, but you still have no idea whether or not you have a high quality suit in your wardrobe. Yes, horn buttons are better quality than plastic and yes fully canvassed suits should (in theory) feel more comfortable than half-canvassed or fused suits but this isn’t always the case, and there are many more factors to take into account, for example the fabric quality. There are Super numbers of course. They can give you a rough idea of how fine the fabric is but again, it’s not necessarily an indicator of quality or performance. The ability of your tailor/cutter – if the person who actually takes the measurements is no good at it the construction quality becomes irrelevant and the suit won’t fit properly. Quality of internal construction e.g. canvassing and interlining – this determines how long the suit will last, how it performs when abused by the dry cleaners and how much shape it has. Ability of the coatmaker and trousermaker – these are the people who actually stitch the garment together, they also control how much shape goes into the garment and how clinical the finish is. The more experienced and thorough the coatmakers are, the better your suit will look. Quality of fabric – this obviously affects durability, comfort and style. Ability of alteration tailors – when you try your suit on for the first time it will need to be adjusted to achieve the perfect fit. It’s crucial that the specific tailors responsible are competent enough to carry out complex alterations so that the beautiful Savile Row cut will not suffer as a result of any changes in measurements. So how do I choose a tailor and what questions should I be asking him or her? I’ve also written an article about the various types of tailored suit available on the market and how you can tell the difference between them. You can read it here: How to choose your tailored suit. 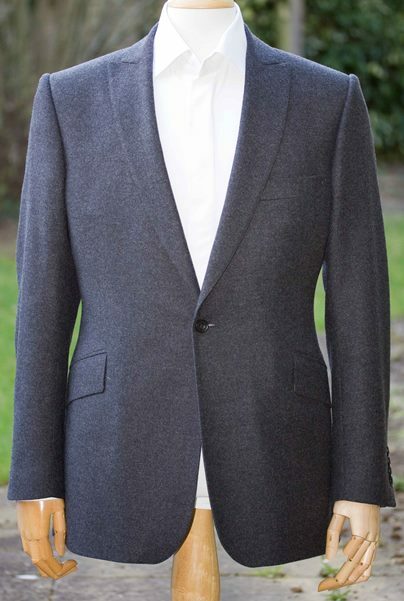 This entry was posted in Bespoke Tailoring, Blog. Bookmark the permalink. ← James Bond – wearing a bespoke suit with disdain.